With the passage of the Washington Voting Rights Act (WVRA), democracy in Washington State is about to get a lot more vibrant! 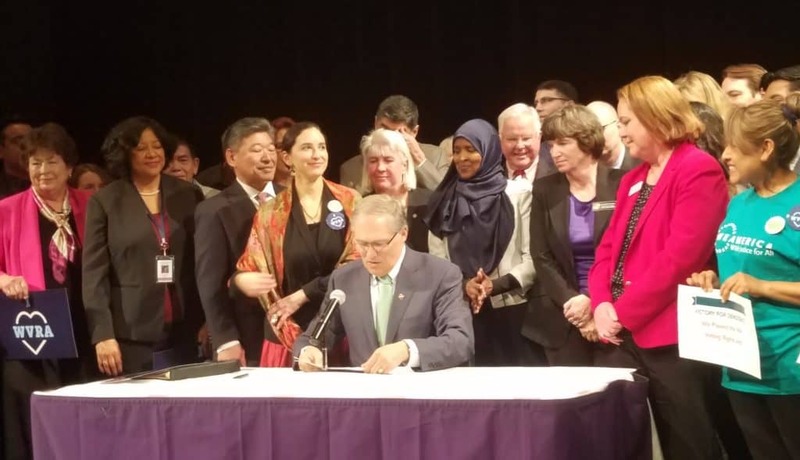 This month, Governor Inslee signed this Act into law, with other measures that will improve voter turnout, ushering in a new era for local representation. For years, communities across Washington State have had to live under unfair voting systems that leave many voices out. That’s why the WVRA is a huge win for our state, and is the fruit of many years of patient organizing. Currently, many of Washington’s communities use “at-large” voting in general elections. That means a majority of voters in the state can decide the result for every council or school board seat in a town, city, or county, rather than local voters. As a result, some communities do not have a fair chance to elect candidates of their choice, candidates who will advocate for their needs in local government. This dynamic disproportionately impacts lower-income communities and communities of color in many local jurisdictions. This weakness our state’s voting process has led to successful lawsuits under the federal Voting Rights Act, that have changed the election systems in Yakima and Pasco. But such federal litigation is very time-consuming and costly – both for communities seeking fairer representation in government, and for the jurisdictions that are sued. More than six years ago, OneAmerica Votes community leaders recognized this injustice to local voters, and sprang into action when the WRVA was first introduced in the Washington State Legislature. Progress for the WVRA’s enactment was slow, but gained momentum following the special election in the 45th legislative district last November, when OneAmerica Votes Justice Fund leaders and volunteers helped elect Manka Dhingra to the Washington State Senate. This helped shift control of Washington’s State Senate to a new Democratic majority. And as the 2018 legislative session began, Representative Mia Gregerson and Senator Rebecca Saldana led the charge for passage of the bill. Both Gregerson and Saldana initially won their seats on the King County Council through the support of OAV and our allies. In both cases, the local Democratic Party prioritized a different candidate. Also in both cases, it was community members who successfully demanded that these qualified women of color be appointed to the legislature, overcoming objections from local Democratic Party leaders. The potential impact of the WVRA to empowering communities all across Washington State cannot be overstated. “The Washington Voting Rights Act will solve real problems that our communities face in Wenatchee,” said Liliana Fausto, a college student from Wenatchee who traveled to Olympia to speak to her legislators in support of WVRA in January. Just as Washington’s grassroots communities led the years-long effort to pass the WVRA, local leaders will be at the center of the Act’s implementation. It’s now up to Washington’s local leaders to demand this change take effect in their communities, and we pledge to work with them every step of the way. Just as OneAmerica Votes has done throughout this campaign, we now look forward to working with these local communities and leaders to ensure that our state’s election systems are fair and take all voices into account. This victory, six years in the making, was the result of tireless activism from communities who have a passion for democracy. It just goes to show that when we organize, we win!